Avocado: How to Insure Productiveness, P. H. Rolfs and C. Rolfs. 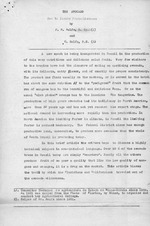 A typed manuscript for an article, "The Avocado: How to Insure Productiveness," by P.H.Rolfs and his daughter Clarissa Rolfs about growing avocados for market in Brazil. i t: I...:. ; .. t.tiv . with its delicate, nutty flavor nxd of exactly the proper consistency. 1J. Consultor' Technico de Agricultura Esto de inaLs-Gerais since 1929. 2). Helper of Dr. Roil's since 1921.
tors any one of which will result in an unproductive tree or grove. information, his guess is likely to be w'onu two times our of three. cial fertilizer to produce beneficial effects. of the bea-ring avocado trees produce only ten per cent of the crp. the surioundln t-rees for food and sunlight and is eliminated. S .. .; : a e I .o : r L -i. .- t.,i ,'. T0 L .c"ve. .- L ,i. .,, :- 1' .> t. t : .e. S 2 : l i- *E .1 1 i L .. ,,, ," ..
.i a' r'' i :* i ) -' . .- -, i. -. ,' .. I o .- .. p .
of .. ..- o-.. 0 t t. c. 1... t.
s.ivent of the spring gro th iis e:.fer:':.x ;.r srome pumoc:uturists. o.s the budiin:; matiod.ci. .i- type pof gr:.ft ei :i1 yed is unitmoo-'t.nt. ati:.-iast toj !-1: team:rsr tre or too low tc iar:Ituro.